At the age of 46, after suffering a near-death experience, Rosa Zharkikh, a Moscow factory worker, began receiving visions. Directed by an unseen external force, she started to draw. Several years later, Zharkikh retired from the factory and moved more completely into the world of her visions. Using thread and fabric, she tried to replicate the magical, flower-like costumes that appeared in her dreams, often working for several years on a single embroidery. She drew more quickly, eventually filling her tiny apartment with hundreds of colorful sheets documenting what she terms the “parallel world.” It is her goal to construct a bridge between this imaginary world and the real one. Without adhering to any one spiritual discipline, Zharkikh combines references from Christianity and Eastern religion in her works. In the 1990s, as a result of improved communications between Russia and the outside world, she became intrigued by Tibetan philosophy, which she felt offered a model of spiritual transformation akin to what she, on her own, had been trying to achieve. 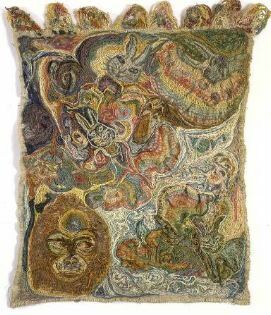 Both her drawings and her embroideries use nested skeins of differing colors to represent graduated stages of consciousness and to enfold self-portraits and symbolic images. Lately, the artist has also been depicting “heroes” from the spirit realm, such as her deceased mother and sister. Zharkikh hopes to be reunited with these perfect spirits, and to this end she has adopted a precise regimen of personal improvement and purification. She eschews television, follows a strict diet and avoids contact with other people. Only grudgingly will she talk about her work, which she refers to as “children,” rather than as art. Beyond the pictorial symbols, Zharkikh imbeds her drawings with messages in a secret hieroglyphic code that only she can understand, but which she refuses to translate. Public recognition would probably mean little to her, and in any case would be difficult to achieve on a large scale in Russia, given the ingrained suspicion of unconventional art that is part of the Socialist Realist legacy. Nevertheless, over the last ten years, Zharkikh has been supported by and exhibited regularly at Moscow's Museum of Outsider Art. She was also included in the fifth and sixth INSITA exhibitions in Bratislava in 1997 and 2000, as well as in the Biennale of Naïve Art in Jagodina in 2001.